If you’re reading this, you’ve probably been bitten by the loft bug. It’s OK. You’re certainly not the first. 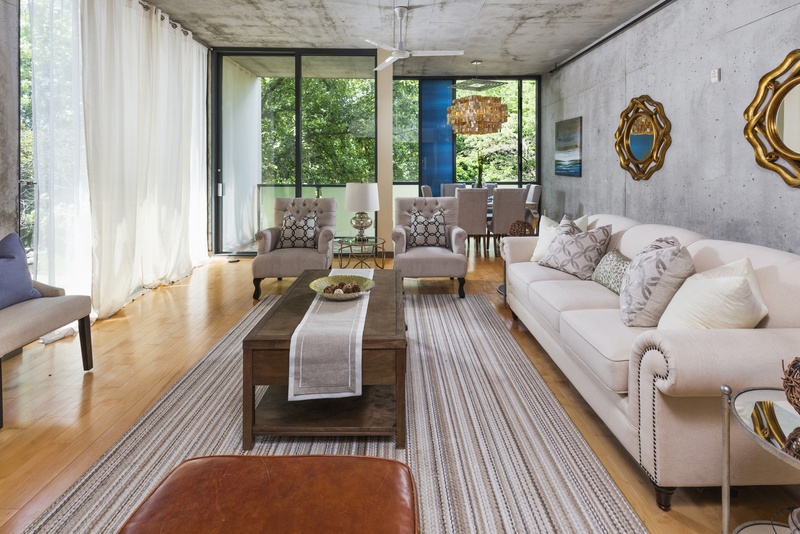 Loft mania has been sweeping Atlanta for years as more and more industrial properties have found new life as residential spaces — folks, it seems, are drawn to hearty construction, modular floor plans, and having a place that’s somehow… organic. This style of home has become so popular, in fact, that architects, looking to the past for inspiration, have re-created such structures to serve 21st century residential purposes with a nod to the timeless fixtures of 19th century commerce. In the really cool examples of “new-construction loft,” the property even comes with an amazing view, proximity to some cool stuff, and easy access for the weekdays. Like this one. Trying to buy just the right loft in Atlanta is a challenge. Downright frustrating in many cases. Those reports of over a "thousand people a month" moving Intown are true, and condo/loft inventory is at an all-time low. Many buyers are left with the feeling they will have to snap up almost anything that pops up or be left behind. If you've had the discipline to wait for the ideal home to appear, your patience may be rewarded here. The address is Tribute Lofts, unit 306, at 480 John Wesley Dobbs Avenue NE, Atlanta GA 30312 in Old Fourth Ward. If you’ve spent a lot of time driving around Atlanta, you might recognize this building, situated on the corner of Freedom Parkway and Boulevard (right next to the onramp in Old Fourth Ward). If you’re envisioning where we’re envisioning, you can probably make a few assumptions: one, that this plot of land has an amazing view of the Downtown skyline (it does); two, that it’s located in the middle of one of the coolest cultural-meets-historic-meets-entertaining neighborhoods in the city (it is); and three, that access to and from the interstate couldn’t be easier on your commute (it couldn’t be). And that’s only the outside. Let’s look closer at Tribute Lofts. Contrary to conventional loft aesthetic, the modular, urban-Euro exterior encloses a space that was only constructed in 2007. There’s an advantage in this recent footprint; an architect is able to borrow from two centuries of industrial nuance, incorporate the parts that work, tweak the ones that don’t and end up with a collection of homes that serve modern tastes seamlessly — no workarounds necessary. When the architect does a particularly good job, you end up with a space like No. 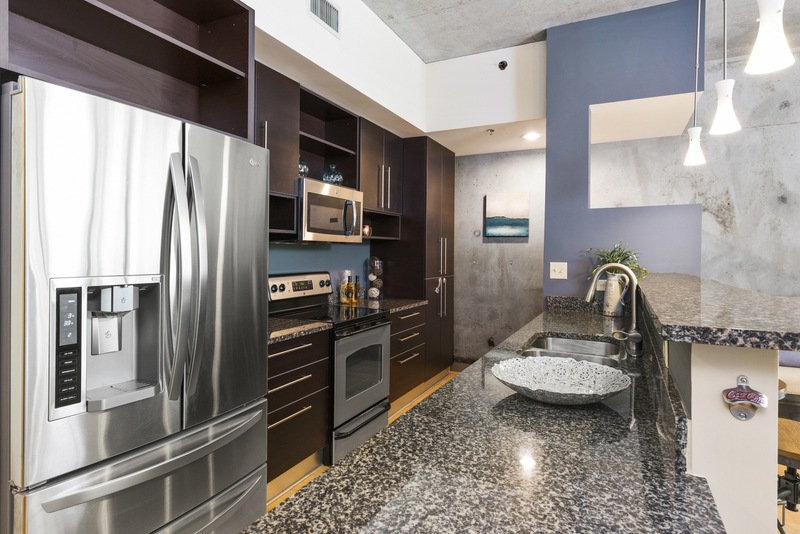 306 in Tribute Lofts: where concrete walls speak of indefatigable construction; where the windows are as high as the 10-foot ceiling; where coveted amenities like stainless appliances and granite countertops were installed as a matter of course; and where there’s a rooftop common area that’s cool enough to regularly hang out at. One of the most charming and necessary elements of a “true loft” is an attention to the virtues of minimalism. For better or for worse, that can often translate into a large, wide-open floor plan where kitchen bleeds into living room, which then turns immediately into the bedroom — the kind of Brooklyn artist’s space you might imagine as festooned by unfinished paintings, hastily hung pots and pans, a disheveled bookshelf, and an unmade bed, all visible from the same spot. There’s a brooding, coffee-and-cigarettes creative charm to a space like this. But in most cases, there’s a reason we have rooms, and walls, and doors. It’s nice to have privacy, to have dedicated spaces where you can cook dinner, entertain guests, get some work done, sleep at night, and keep your stuff. In this spirit of “modern loft,” minimalism is achieved through maximizing the function of (in this case) 1,306 square feet, without losing the je ne sais quoi. 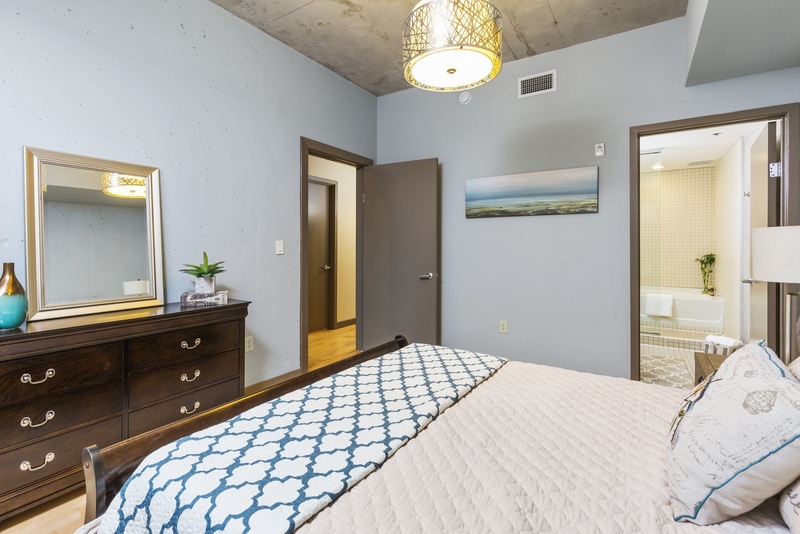 The first thing that you’ll notice walking into this unit are the two bedrooms. The one on the right is ideal for the purpose and is attached to a spa-like private bath and a considerable amount of closet space. The one on the left, separated from the entryway by a sliding panel, falls more into the category of “multi-purpose:” for a couple with a need for a home office, this room fits the bill perfectly; for those who are looking to have a guest suite, it’s ideal. If some laptop work needs to be done from time to time, there’s actually a little nook at the end of the kitchen that’ll pull duty as a mini-home office admirably (it’s a couple of steps in evolution ahead of the makeshift kitchen nook we’ve all had). Speaking of the kitchen, let’s go into the main space. Lining the back wall and long breakfast island, the dark wood tones, and darkly-marbled granite lends a subdued flair; it’s the kind of kitchen that looks great in the daytime, but evokes an elegant warmth when evening comes and it’s time to prep dinner. Part of this charm owes itself to the view over the counter, into the concrete-lined living area which, refreshingly, is several feet wider than it needs to be to accommodate even non-essential furniture without feeling cramped. At the end of the space, a floor-to-ceiling bank of windows overlooks a smattering of trees, lending a pastoral vibe to the view from the dining area or the intimate private balcony (or anywhere else in the unit, for that matter). The effect is a fusion of sorts: old warehouse, new windows, a bold color scheme, contemporary and simple, and yet, there’s something just a little eccentric about it, without going overboard. The kind of space that could be decorated with Roche Bobois or Louis XIV, or a mix, and everything would just, somehow, work. Which is what “neue loft” is about, really: practical, with a jolt of imagination to keep it fresh. Just add your own personality, and you’re set. Elsewhere on the property… well, let’s go down the list. This place comes with covered garage parking, so no worries about battling for a parallel space outside. Once you walk into the lobby, you’ll find an aesthetic that clicks with what you would expect from the walk-up to the front door — almost like the designer went back to Manhattan in the ‘60s, found the ideas that worked, and rebooted them. 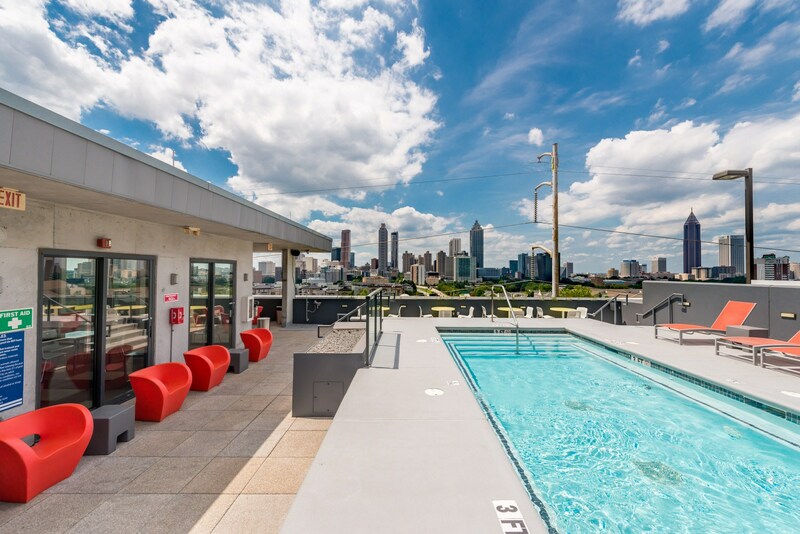 This evocation is mirrored on the top floor, where a long, brightly accented pool deck offers a great place to take a dip on a hot afternoon, and where the onsite fitness center and indoor lounge share one very important detail: a dashing, unobstructed view of the downtown cityscape, which begins just a few hundred yards to the west. On the ground floor, a collection of street-level retail shops lends a city-in-microcosm feel. Condesa Coffee, in other words, will probably be a frequented stop — give them a couple of weeks to learn your name, and you’re all set. And then, there’s proximity. Three blocks to the south will land you in what is the de facto Edgewood Entertainment District, where seedy bars, amazing eateries, and crazy street art coexist, hand-in-hand. A few blocks to the west, and you’ll find yourself at Krog Street Market, home to one of the most innovative restaurant scenes in the American South. One block to the east, the connection to I-75/I-85 Connector. If you work anywhere in the city, you’re already close. This place is pretty much perfect for a couple who appreciates having a bit of flexibility in what life has in store for them, and are looking for a space that’s equally versatile. Working on careers; kids, maybe, a couple of years down the line; if we ever need to upgrade, that won’t be for a while, and heaven knows this place would make for a heck of a rental or re-sell (the trendiness of this part of town is only rising, along with property values, so that’s something to think about, too). And in the meantime? It’s a fun place to live. What are you waiting for? 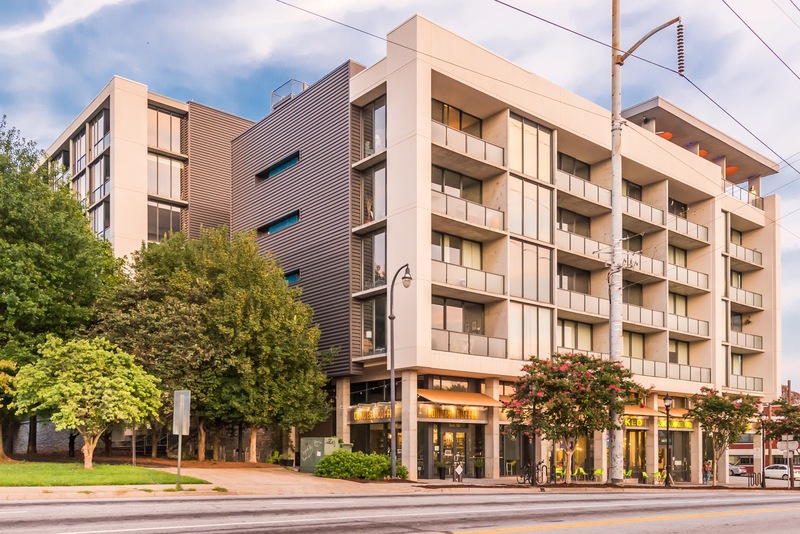 If you're in the market (or know someone who is), get to this home right way because loft prices in Atlanta are up the last 42 months in a row. This unit won't last long. The seller is represented by The Keen Brothers, Ben & Joshua Keen.